$364 is our clearance price while supplies last! 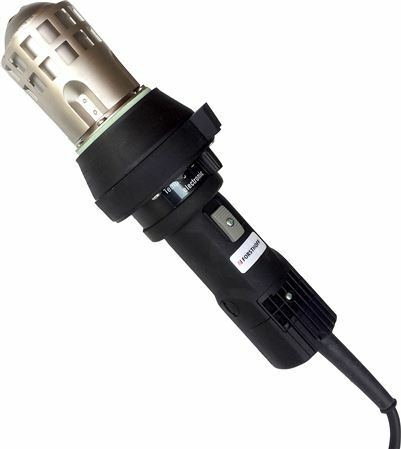 This hot air blower can be hand held or built into a machine for continuous operation. For use wherever hot air is needed for warming, heating, forming, shrinking or activation. Air flow rate of 450 liter/minute depending on the nozzle used. Grand LE (electronic) with variable temperature from room temperature to 650°C (1200°F). Air flow can be varied by means of diverse push-on nozzles. For hand held operation, the handle is ergonomic and easy to hold. Brushes are easily changed from the outside without opening the tool. For the painting and decorating industry, the wide slot push-on nozzle removes old paint and varnish easily. Air Flow Rate: 450 liters/min, Weight 2 lbs 11 oz, 120V, 2200W, Double Insulated.